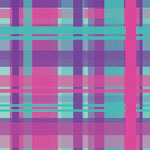 Far from down on the farm, Candy Shop plaid will have you dreaming of lollipops and cotton candy, with its bright pinks, purples, and teals. Be apart of the trendsetters bringing plaid back with a new revival of color and style. Available in several other color combinations!